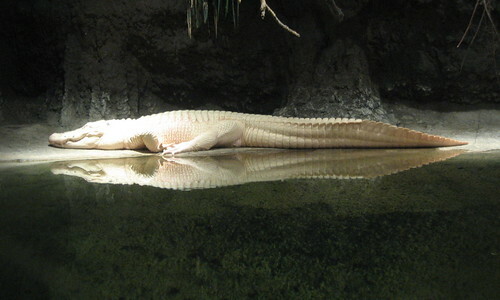 I went to New Orleans and saw a white alligator! You can click on the gator to see more of the photos from my quickie trip to New Orleans. The worldwide party went off pretty much excellently. We really did have a guy at the South Pole which I thought was just terrific. I ate some Southern foods up to and including grits, gumbo, alligator (in aforementioned gumbo), po-boys, Abita beer (just like this blog’s name! ), beignets, chickory coffee, biscuits and a whole lot of bacon. I did not get to try the praline bacon that other people had at the breakfast after the meetup because I was sleeping in, in the world’s most comfy bed. I got back, via the long route through Boston/Belmont, on Tuesday night and have been hosting a houseguest until this morning. Then I went to work at the library where me and my friend Stan finally linked the first library record to library book barcode, starting the final big process to get the library automated which I’m hoping I’ll be able to wrap up in late August. It’s been raining, I’ve been feeling slothful, Summer is excellent and why am I still typing?